Garvan Institute of Medical Research, Sydney, NSW Gregory J. Cooney BSc(Hons) PhD Greg Cooney completed his PhD at Sydney University in 1980 and spent four years in the Department of Biochemistry at the Oxford University working on the role of thermogenic brown adipose tissue in energy balance and obesity. 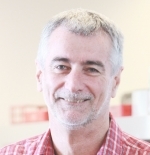 He returned to Sydney in 1985 and worked with animal models of obesity and insulin resistance in the Endocrinology Department at RPAH. He joined the Garvan Institute in 1997 to continue studies in obesity, insulin resistance and type 2 diabetes. Greg is an NHMRC Senior Research Fellow and has served as a Senior Editor for the Journal of Endocrinology, an Associate Editor for Diabetologia and is on the Editorial Board of Diabetes and the American Journal of Physiology. Greg was Treasurer on the first ANZOS Council and has also been a Treasurer and Vice President of the Australian Diabetes Society.